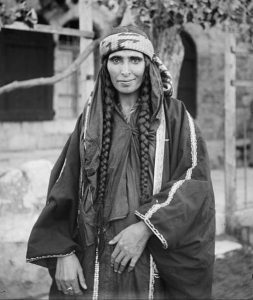 Photo: Bedouin woman, 1898. Library of Congress accessed on Wikimedia Commons. Arabs include Bedouins, the nomadic people of the desert. Arabs represent a group of peoples with tribal and linguistic connections across North Africa and the Middle East. The term Arab pre-dates Islam by hundreds of years and refers to the ethnic group. Arabs (Palestinian & Related) represents 100 unrelated Northern Arabs (Syria, Lebanon, Jordan, and Palestinian) living in Dubai who were sampled in 2004 by the Dubai police, US FBI, and Strathclyde University, UK. Source publication: STR population diversity in nine ethnic populations living in Dubai, FSI 152 (2005) 267-279.